If you have an existing collar or leash that doesn't have any identification built in, rivet-on tungsten name plate is the best choice. It can be engraved with some important information or decoration patterns on its surface, not only for identifying pets when they are lost, but also for fashion. Every plate is curved to fit onto your dog's collar. If you don't want your rivet-on tungsten name plate to be curved, you can request it not to be bent in the order notes when you are checking out. That way if you want to use your plate for items other than collars, you can do so. 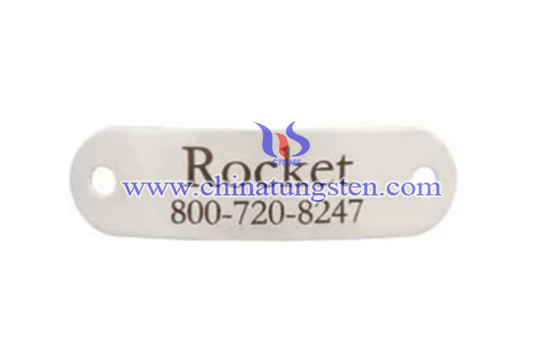 If you have any interest in rivet-on tungsten name plate, please feel free to contact us by email: sales@chinatungsten.com sales@xiamentungsten.com or by telephone:0086 592 5129696.